Over the last few weeks we’ve been on campaign trying to catch what someone once described as ‘the secret light of plants’. The previous blog entries on the HyFLEX campaign give you some idea of what we’ve been doing out in the field to support the development of candidate Earth Explorer mission called FLEX. This entry should help describe why we are taking the measurements. The basic mechanism is that through the process of photosynthesis, plants use the energy in sunlight and convert it into chemical energy to grow. They absorb visible light, but a small part of this energy is emitted again in the red and near-infrared part of the electromagnetic spectrum. In other words, plants absorb one colour and emit another – in the form of fluorescence. Measurements of fluorescence, therefore, could be used as an indicator of photosynthetic activity. The aim of the candidate FLEX mission is to provide global maps of vegetation fluorescence to improve our understanding of how global change is affecting the health of our plants. The problem is that we can’t see fluorescence because the red light reflected from the Sun is stronger than that of fluorescence and, of course, our eyes are not able to see in the near-infrared. This is why people call it the ‘secret light’. But the good news is that there are ways to ‘see’ it and measure it, which is what we’ve been trying to do in the campaign. The concept of the FLEX mission is to measure fluorescence from space without needing an active system, just using sunlight. To do this a very sensitive instrument is needed. As part of the development process, we have to check that this can first be done from the air with the appropriate instrumentation. For this reason FZ-Juelich in Germany with SPECIM in Finland developed the HyPlant sensor. In principle HyPlant spans the scales from single leaves (cm resolution, when used on ground) to the ecosystem using it from an airborne plattform. 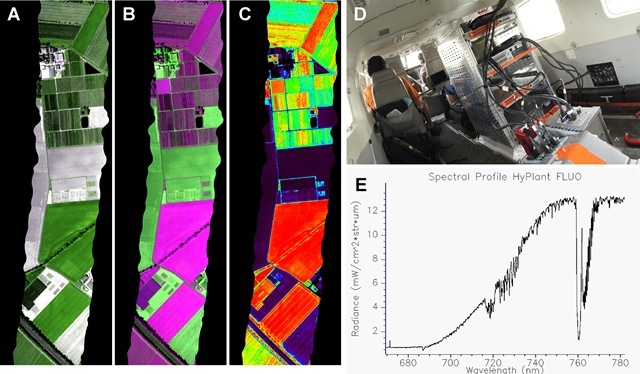 So here we are, with the HyPlant sensor placed in an aircraft and additional instruments on the ground to check that what we get from the airborne sensor, flying at 600 m, are really measuring the secret light of plants. Since a picture is worth a thousand words, you can have a look at one of the first picture taken. In the image above (A) and (B) give a true and false colour image of an agricultural area in Germany. As a first step, one can calculate the ‘normalised difference vegetation index’ (NDVI), which is a simple indicator for how green the vegetation in the image is (C). This information can already be used to estimate canopy chlorophyll content. From (D) one gets an impression of what it looks like inside the aircraft and how the sensor is mounted. In the meantime we gathered a huge amount of data and during the coming months the team will analyse them in greater detail and everyone will look at vegetation reflectance spectra (E), showing the high spectral resolution of the fluorescence module (0.25 nm spectral resolution under flight conditions), which allows the exact detection of Sun-induced fluorescence. Again, we want to give a big thanks to all the teams and people who contributed to this campaign and hope we will get the first results soon.